Here’s a cute story just in time for Valentine’s Day. A romantic moment at Be My Guest, the new castle restaurant in New Fantasyland, a major Magic Kingdom expansion at Disney World, Orlando. During lunch, in the dark West Wing of the Beauty and the Beast-themed restaurant, an Illinois man dropped to one knee and proposed to his unsuspecting girlfriend. 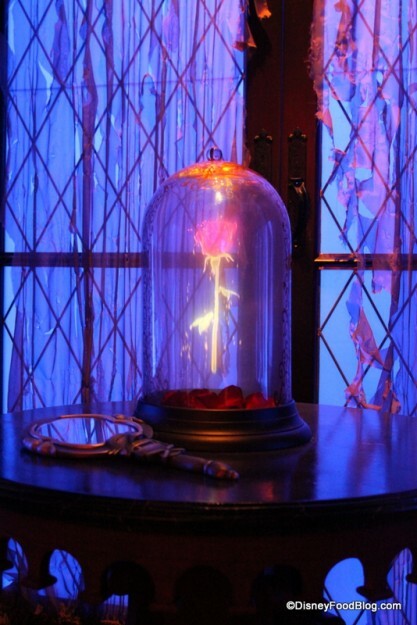 He was standing before the dining room’s main attraction, the holographic rose that slowly rotates under a glass bell jar (like in the movie). The audience were the diners struck by cupid’s arrows all seeming to clap at once and snap photos. “We’ve been dating for 18 months, I finally found my little princess,” Josh Phillips, 27, a graphic designer from Homer Glen, IL. “‘Beauty and the Beast’ is her favorite movie. I didn’t want the last rose petal to fall before I had a chance to tell her I love her.” awwwww..
Angelica Smith, 24, said she was blown away by the surprise proposal. “Every little girl dreams about where she gets proposed to and there’s no better place than this castle,” she said. RESTAURANT TIP: Arrive early, cross the stone bridge which is past the fierce-looking gargoyles and line up outside the Beast’s Castle before it opens at 10:30 a.m. daily. When the velvet rope drops, you file through the Armor Hallway into the Beast’s parlor and place your orders on high-tech touch screens. Thanks to radio-frequency devices stamped with a rose, food arrives fast on glass-encased carts served by cast members wearing purple doublets over white shirts and knickers. For information on Be Our Guest, check www.disneyworld.com. This entry was posted in Disney World, General and tagged be, guest, our, proposal, valentine's day by JNYFAV. Bookmark the permalink. That is so awesome! For a guy to understand his girlfriend to know that proposing at that spot…just…wow! What a sweet story! Thanks for the restaurant tip also! Planning on having lunch there in September!